Realistic Owl is a highly effective bird and pest repellent solution. The realistic looking owl gives the appearance of actively hunting. This great owl decoy has a strong deterring factor for garden birds with its lifelike features and size. Birds and pests get intimidated by the predator and will leave the area. It can drive away birds, pests, pigeons, mice. Put the realistic owl in a visible location, such as your garden, lawn, farm, tree or shrub. The owl has anchor at the bottom and can be fixed on the stakes by screws (not included screws). In short, it is a very effective tool to help protect your garden and the fields. Please make sure turn ON switch before charging. Please change the position of the owl at all times. Every few days put the owl in the house then take it out to the garden again to prevent birds from getting used to it. Open bottom tab of Owl Decoy and fill with sand (not included) to weight for more stability. 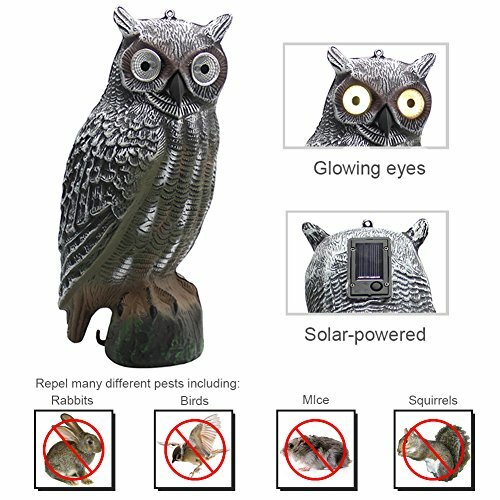 Solar powered -- the scarecrow automatically absorbs solar energy through solar panels, at night the owl's eyes will be light automatically to keep mice, birds, squirrels, and other destructive pests away. Just put the owl in a visible location such as a tree or shrub. The owl has anchor at the bottom and can be fixed on the stakes by screws (not included screws). Great for the garden, patio, or porch. Eco-friendly and wildlife friendly -- get rid of birds and pests humanely without harming them. Measures 15.7" Height x 6.7" Width. Made of sturdy molded plastic and seems very realistic, scare away birds effectively. Note: Please change the position of the owl at all times to prevent birds from getting used to it. 100% satisfaction guaranteed! If you have any problems, please feel free to contact us. If you have any questions about this product by YOFIT, contact us by completing and submitting the form below. If you are looking for a specif part number, please include it with your message.